Just a stone's throw from the heart of Winnipeg, at the junction of the Red and Assiniboine rivers, lies the Nature Conservancy of Canada's (NCC's) The Forks Prairie Garden project. This project has become NCC's most frequently visited project in Manitoba with an estimated four million visitors passing through each year. Further upgrades to the site will continue with interpretive signs and a larger gathering area in the plan, pending funding. 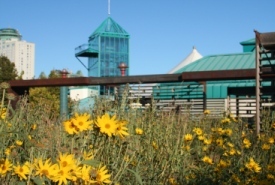 In the meantime, make sure to check out The Forks Prairie Garden throughout the seasons to experience how the garden changes throughout the year. While you’re there make sure to take a picture and tag NCC in it throughout your social media (@NCC_CNC). We would love to see you enjoying the space!